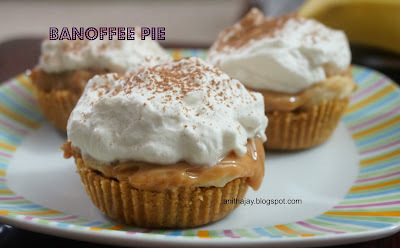 For SFC international fusion recipe we need to do Banoffee pie. Its made with banana and Toffee. I never tasted Banoffee pie before, but when it announced I'm very much eager to try this recipe. But this dish is high in calorie, so want to make it as bite size. So i made it in the crust in muffin pan. Powder the biscuits using food processor or placing it in a zip lock cover and crushed it using rolling pin. Melt the butter , pour the batter little by little to biscuit crust and mix it well. Insert the cup liner in muffin pan and spread the mixture tightly and the press base and sides by hand. Cover it cling wrapper and keep in refrigerate for 2-3 hours. While crust getting cool in fridge make the Toffee using condensed milk. Place unopened condensed milk in a big pot ,fill with water until the can immerse. Boil for 2- 3 hours , make sure can immerse in water all the time. Open the can when it is cool and take out the biscuit crust from fridge. Slice the Bananas and spread 2-3 slice on top of each biscuit crust . Spread 1-2 tbsp of toffee on top of it. Put back into fridge until ready to serve. While serving top it with whipping cream, dust over some coco powder and serve chill.